Lady Talks a Lot: I would hate to have to tell my son, Sharks are gone. I would hate to have to tell my son, Sharks are gone. My son loves sharks. He dreams of being able to go swimming in the oceans with them. I may have to tell him that is not possible because they were killed to make money. That humanity destroyed something so old, wonderful and majestic not out of fear, but greed. 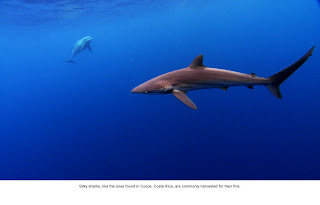 I was watching a documentary, http://www.sharkwater.com/, about the destruction of sharks tonight. 90% of the world’s shark population has been killed. It was shocking. Men where cutting the fins of live sharks and then tossing them into the Ocean to bleed to death. Millions of sharks are being killed every week. Killed, not to feed the hungry, but to make shark fin soup. It was much like what was done to elephants for ivory, buffalo for tongues and hides, and bears for their gall bladders. Killed for one piece and everything else wasted. I am still scared of sharks, but that does not make what is being done acceptable. This is wrong and must be stopped. Now some people will not care about the death of sharks. However it must be pointed out that they are a key part of the world ecosystem. Without sharks the Oceans balance will be completely disrupted, causing the ecosystems to be destroyed. The largest part of oxygen comes from the Ocean. 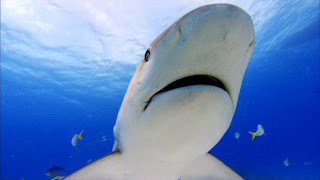 The destruction of Sharks will have a huge and negative impact on the production of Oxygen. So if you don’t take a stand against shark hunting to save the sharks, do it to continue breathing. Check out http://www.savingsharks.com/. I had thought about trying shark fin soup just to see what it was like. Now that I have seen Shark Water I will not try shark fin soup. I hope it is not too late for the sharks and the other species we are harvesting without thought of the consequences. What a legacy we are leaving our children; sorry we used it up, killed it or destroyed it, but enjoy what is left over for as long as you can.